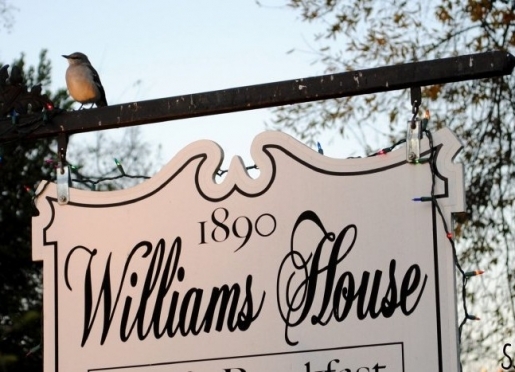 The 1890 Williams House Inn in Hot Springs, Arkansas celebrates a long history of hospitality, and we look forward to sharing our joyous home with you. Dr. A.U. Williams, a prominent physician and businessman built this exquisite Arkansas estate, where four generations of his family lived. 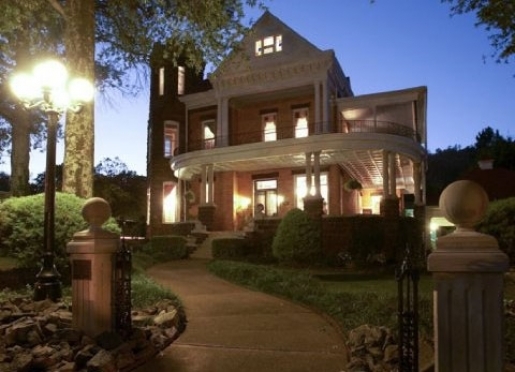 In fact, 1890 Williams House Inn was the first bed and breakfast in the state of Arkansas, established in 1980. The home continues to welcome travelers today; we invite you to come into our parlor for refreshments and good conversation, sharing in the history and hospitality. The 1890 Williams House Inn is the historic-district's jewel which showcases beautiful woodwork and architectural detail. The Main House has 6,500 sq. feet of elegance & charm with six extra large guest rooms and the Carriage House has 2,000 sq ft and three extra large guest rooms. 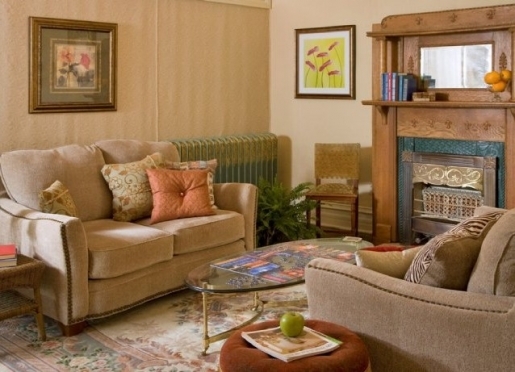 1890 Williams House Inn has a Victorian flair with modern conveniences. Your home away from home, nestled in the Oachita Mountains. A high level of comfort, privacy, and friendly service in an environment that reflects the quiet elegance of another era. Upstairs there is a collection of videos and books that you are welcomed to use. Enjoy a lazy afternoon, reading on one of the verandas relaxing in an atmosphere you just can't get at a hotel. 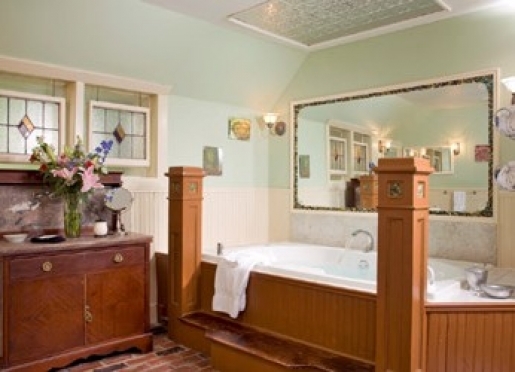 1890 Williams House Inn reflects the quiet elegance of an earlier time. Listed on the National Register of Historic Places, the house is masterfully constructed and this historic-district jewel showcases beautiful woodwork, stained glass and architectural detail. Comfort and hospitality are two of the most important things when traveling. Comfy beds, nice people, and gourmet quality food can make or break a trip. When you come to the Williams House, prepare to be enraptured with your entire experience. Travelers are always looking for memorable and relaxing experiences. Let’s discover more through the words of our innkeepers. Many thanks to Lynda Burpo for sharing her own secrets with BBOnline.com! Why do most travelers stay at your inn? Celebrations, many anniversaries, weddings, & birthdays. Oak Lawn race track is in Hot Springs, with races from mid January through mid April. Also we are in a central location, for those traveling from Dallas, Memphis, Louisiana, Missouri, Oklahoma & Mississippi. What makes your inn unique? We were the first bed & breakfast in AR in 1980. What do you love most about your inn? Our spacious, elegant & unique rooms with original oak wood throughout the house, our huge veranda wrapping around the lower level of the house, and porch upstairs with views of town & the mountains. If someone has never been to your city, what is the #1 reason to come visit? The bath houses for a great massage & bath! What’s the best compliment you have ever received about the inn? That our whole staff is extremely friendly & eager to take care of any requests our guests may have, making everyone feel very welcome. What’s the best kept secret about the area? The beauty of the area set in the mountains & near the lakes. If a traveler is staying at your inn for 4 nights, what should he/she do in the area? Bath house massage, enjoying an exciting day at Oaklawn Race track, hiking & exploring the mountains, taking in the view from the Mountain Tower, visiting Garvan Woodland Gardens, exploring the many shops downtown, enjoying many wonderful restaurants from Italian to Cajun, to incredible steaks & seafood. Is there anything within walking distance of your inn? All of downtown is within five blocks of the Williams House. What is your favorite restaurant/food in the area? Any good area guides/websites that travelers could reference? How many rooms does your inn have? We have nine rooms, two that are two bedroom suites. 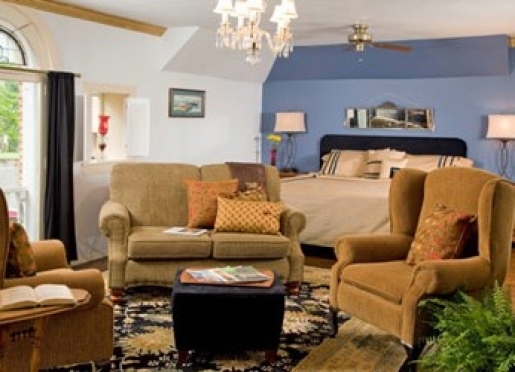 Our Copper Cottage is our pet friendly & handicap suite. 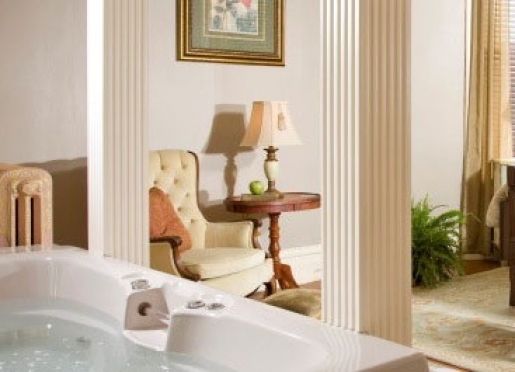 Historic Spa City of Hot Springs Arkansas, the boyhood home of President Bill Clinton, encompasses a National Park and features world-renowned Bathhouse Row and three lakes with every type of water sport available. For more details about activities and attractions in the Hot Springs area, please visit our website. It’s the water that has attracted thousands of people to Hot Springs. People have been using the hot springs here for more than 200 years, bathing in the mineral-rich water to treat illness and relieve stress. There is much to do in Hot Springs National Park. Tour the historic Fordyce Bathhouse, where the Park Visitor Center is now located. Cruise down the grand promenade of Bathhouse Row within National Historic Landmark District. Take a hike on over 26 miles of trails, pack a picnic, and take a bath, of course! Arkansas boasts a number of lakes and waterways. Four of these lakes- Catherine, De Gray, Hamilton and Ouachita are near the Hot Springs area. They are perfect for watersports and all are within 20 miles. Historic, romantic 1890 Williams House Inn; the perfect Hot Springs Wedding! Customize your wedding, reception, anniversary, birthday, girls weekend, family reunion, business meeting, bridal shower and more. Let our wedding coordinator work with you to make your special day all you wish it to be. The coordinator will meet with as you make your reservation so that all of your details and requests are formalized. The coordinator will be on-site for your wedding so that all of your wedding dreams are put into reality. If you wish, the minister, photographer, bakery, florist and even a horse drawn carriage will all be coordinated through the Inn. When you choose to have your wedding at the 1890 Williams House Inn you may choose your ceremony and reception locations based on your desires and the feel of the Inn. There are many interior locations for your ceremony such as the main red oak staircase or the black marble fire place both of which are located in the reception hall. Exterior locations are numerous in our lush garden, the arbor, on one of the two verandas or the front steps of the Main House. You may check availability for weddings and gatherings through the Availability/Rates button. Romantic facilities and attentive services will allow you to have your dream wedding and reception at 1890 Williams House Inn. 1890 Williams House Inn is a no smoking Inn. 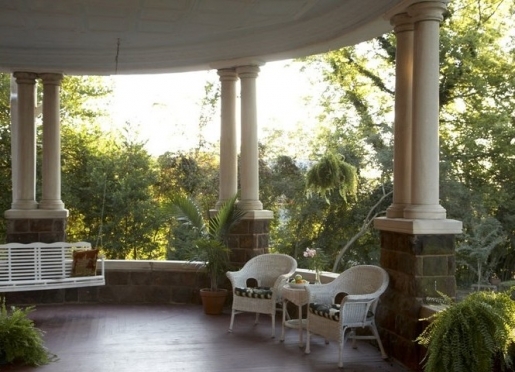 Wedding guests choosing to smoke are allowed to smoke on the verandas and in the gardens. 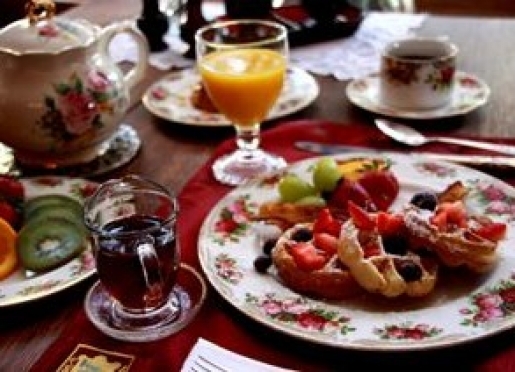 Enjoy a delicious full breakfast in the formal dining room of our Hot Springs Inn, served 8:30 to 9:30 am Saturday and Sunday mornings and 8:30 to 9:00 am Monday through Friday mornings. Private breakfast is served in the Parlor Suite, Williams Suite and Turret Suite each morning. Breakfasts are served in the dining room for all of the guests except those staying in the Parlor Suite and Williams Suite (where breakfasts are served at a cozy table for two in the sitting room portion of the suites). The dining room is very open, and gives the choice of eating together with other guests or privately at your own table. The breakfasts are gourmet quality and simply outstanding, be sure to try one of the muffin creations! You are also invited to complimentary coffee, hot chocolate, tea, spring water, soda, and the cookie jar.